Sew-on labels are the only choice when it comes to delicate, expensive fabrics like silk or satin. Irons would damage these fabrics, and stick-on labels tend to look tacky when put on pricey fabrics like these. Make sure you use a thinner needle and a thread that matches the fabric you are attaching your clothing label to. 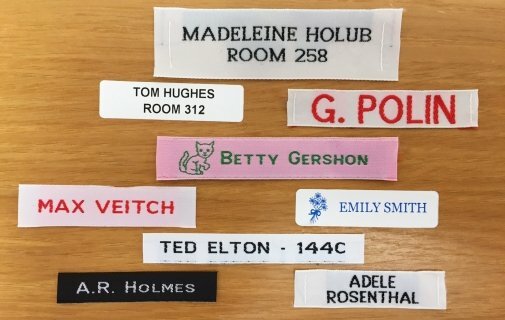 Sew-on labels are also ideal for homemade knitted items, whether you are selling them in your shop, or giving them to your loved ones. Since they have a more handmade feel because they are attached with thread, they keep the feel of your garment. Sewing labels are ideal for situations where you want to be able to easily remove the label at a later point without damaging the cloth. Iron-on labels are manufactured to be permanent, and, thus, don’t come off of your garments easily once they have been attached. Stick-on labels will come off, but they may leave a sticky residue or cause the fabric to fade and wear in a weird pattern around them, if you aren’t careful.